Green Flash Brewing Co. announces that they have partnered with like-minded Michigan brewer, Founders Brewing Co. to produce a first-time, limited release called Linchpin White IPA. The Brewmasters from each celebrated craft brewery—Chuck Silva (Green Flash) and Jeremy Kosmicki (Founders) assembled privately last month in San Diego to develop the beer, and it will debut during the Craft Brewers Conference in San Diego and move on to limited release beginning May 2012. These well matched breweries have been individually brewing up several of the world’s top flavor-forward ales and have now come together to collaborate on an uncommon and emerging beer style. "Founders makes world-class beer,” says Green Flash Brewing Co.’s Co-founder and President, Mike Hinkley. “It's not available in San Diego, so I always look to taste some when I am on the road. Our Sales Chief, Jim Kenny presented the idea and I was immediately all for it. Then Chuck and Jeremy settled on White IPA. I can't wait to tap these kegs and share this innovative new release with the national community of craft beer fans." “There’s a lot going on in this beer with two yeast strains, copious amounts of wheat malt, and a big focus on ‘C’ hops to deliver a citrus explosion,” explains Green Flash Brewmaster, Chuck Silva. “In fact we lined up more than a dozen hop varieties in the brewery to select three hops with the biggest citrus character to dry hop the beer. A beer with so many components can be held together with a “Linchpin”. The official “Linchpin” of this beer is the skillful collaboration between the two breweries to create a unique hop-forward brew. Linchpins are symbolic: two simple shapes that combine to strengthen a bond amongst many different pieces. 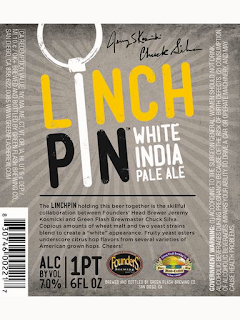 Linchpin White IPA will be released during the May 2012 Craft Brewers Conference in San Diego and will then be available in limited supply via bottle-conditioned 22oz bottles and by the keg for special release events nationally in May and June 2012.